Manchester United forward Alexis Sanchez admitted he is "worried" having failed to bring more joy to the Premier League club and their fans. Sanchez has struggled for form and fitness since arriving from rivals Arsenal in January last year, with the 30-year-old scoring just five goals as a United player. United caretaker manager Ole Gunnar Solskjaer said he cannot help Sanchez after the former Barcelona star's disappointing performance in Tuesday's 2-0 first-leg loss to Paris Saint-Germain in the Champions League. And ahead of Monday's FA Cup fifth-round meeting with Chelsea, Sanchez said he is determined to showcase his best at Old Trafford. 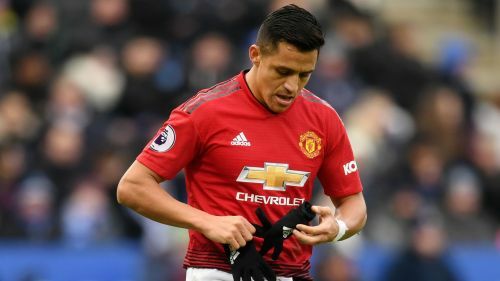 "He (Solskjaer) hasn't spoken to me a great deal about what I have to do on the pitch, but I think I'm an experienced player and I think I know what I need to do and what I shouldn't do," Sanchez told the BBC. This will help you survive a weekend of football without #MUFC! "I don't know how people see me, but football is what I've loved from being a kid and it's my passion," Sanchez added. Sanchez also confirmed that he was injured after an assistant referee ran into him while warming up during United's Champions League fixture against Ligue 1 holders PSG. The Chile international underwhelmed after replacing injured team-mate Jesse Lingard on the stroke of half-time. "The referee's assistant, when we had a counter-attack, came flying down the line, and I had my foot there and he crashed into me. Bang," Sanchez said. "And I went back to the dugout and I said to [reserve goalkeeper] Sergio Romero: 'I've just been whacked and I'm about to go on'. I've got bruising but that's not an excuse for not being on my game in the way that I normally am."